The visual preflight assessment is an important step in mitigating airplane flight hazards. The purpose of the preflight assessment is to ensure that the airplane meets regulatory airworthiness standards and is in a safe mechanical condition prior to flight. The term “airworthy” means that the aircraft and its component parts meet the airplane’s type design or is in a properly altered configuration and is in a condition for safe operation. The inspection has two parts and involves the pilot inspecting the airplane’s airworthiness status and a visual preflight inspection of the airplane following the AFM/POH to determine the required items for inspection. [Figures 2-1 through 2-3] The owner/operator is primarily responsible for maintenance, but the pilot is (solely) responsible for determining the airworthiness (and/or safety) of the airplane for flight. Figure 2-1. 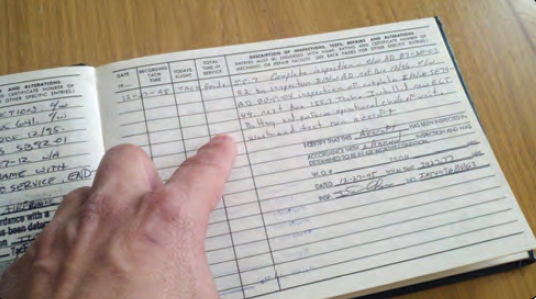 Pilots must view the aircraft’s maintenance logbook prior to flight to ensure the aircraft is safe to fly. Figure 2-2. A visual inspection of the aircraft before flight is an important step in mitigating airplane flight hazards. Figure 2-3. 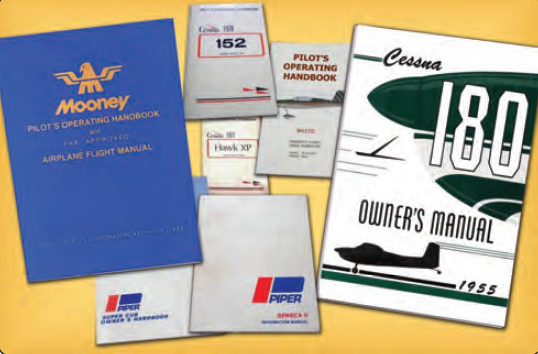 Airplane Flight Manuals (AFM) and the Pilot Operating Handbook (POH) for each individual aircraft explain the required items for inspection. Figure 2-4. 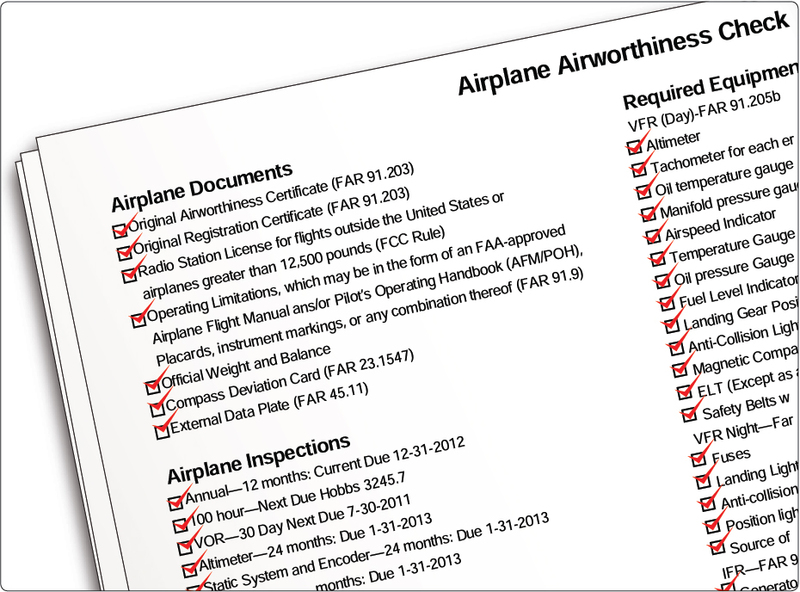 A sample airworthiness checklist used by pilots to inspect an aircraft. A review determines if the required maintenance and inspections have been performed on the airplane. Any discrepancies must be addressed prior to flight. 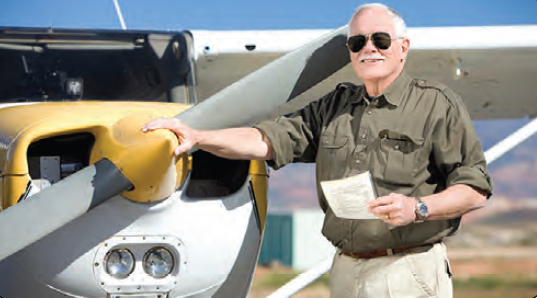 Once the pilot has determined that the airplane’s logbooks provide factual assurance that the aircraft meets its airworthy requirements, it is appropriate to visually inspect the airplane. The visual preflight inspection of the airplane should begin while approaching the airplane on the ramp. The pilot should make note of the general appearance of the airplane, looking for discrepancies such as misalignment of the landing gear and airplane structure. The pilot should also take note of any distortions of the wings, fuselage, and tail, as well as skin damage and any staining, dripping, or puddles of fuel or oils. The inspection should start with the cabin door. If the door is hard to open or close, does not fit snugly, or the door latches do not engage or disengage smoothly, the surrounding structure, such as the door post, should be inspected for misalignment which could indicate structural damage. The visual preflight inspection should continue to the interior of the cabin or cockpit where carpeting should be inspected to ensure that it is serviceable, dry, and properly affixed; seats belts and shoulder harnesses should be inspected to ensure that they are free from fraying, latch properly, and are securely attached to their mounting fittings; seats should be inspected to ensure that the seats properly latch into the seat rails through the seat lock pins and that seat rail holes are not abnormally worn to an oval shape; [Figure 2-5] the windshield and windows should be inspected to ensure that they are clean and free from cracks, and crazing. A dirty, scratched, and/or a severely crazed window can result in near zero visibility due to light refraction at certain angles from the sun. Figure 2-5. 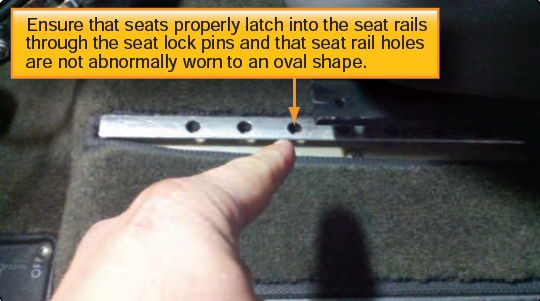 Seats should be inspected to ensure that they are properly latched into the seat rails and checked for damage. Fuel selectors should be checked for proper operation in all positions, including the OFF position. Stiff fuel selectors or where the tank position is not legible or lacking detents are unacceptable. Trim wheels, which include elevator and may include rudder and aileron, are set for takeoff position. Flight instruments must read correctly. Airspeed zero; altimeter when properly set to the current barometric setting should indicate the field elevation within 75 feet for IFR flight; the magnetic compass should indicate the airplane’s direction accurately; and the compass correction card should be legible and complete. For conventional wet magnetic compasses, the instrument face must be clear and the instrument case full of fluid. A cloudy instrument face, bubbles in the fluid, or a partially filled case renders the compass unusable. The vertical speed indictor (VSI) should read zero. If the VSI does not show a zero reading, a small screwdriver can be used to zero the instrument. 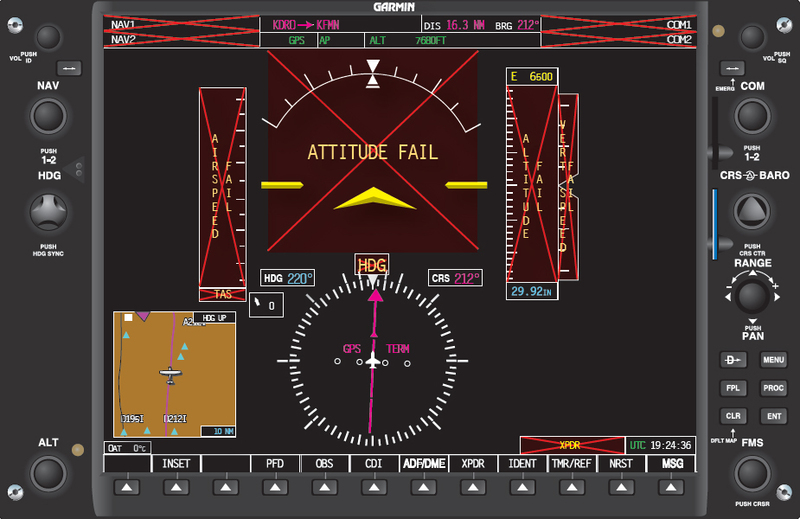 The VSI is the only flight instrument that a pilot has the prerogative to adjust. All others must be adjusted by an FAA-certificated repairman or mechanic. Mechanical air-driven gyro instruments must be inspected for signs of hazing on the instrument face, which may indicate leaks. If the airplane has retractable gear, landing gear down and locked lights are checked green. Check the landing gear switch is DOWN, then turn the master switch to the ON position and fuel qualities must be noted on the fuel quantity gauges and compared to a visual inspection of the tank level. If so equipped, fuel pumps may be placed in the ON position to verify fuel pressure in the proper operating range. Other items may include checking that lights for both the interior and exterior airplane positions are operating and any annunciator panel checks. Advanced avionics aircraft have specific requirements for testing Integrated Flight Deck (IFD) “glass-panel” avionics and supporting systems prior to flight. IFD’s are complex electronic systems typically integrating flight control, navigation and communication, weather, terrain, and traffic subsystems with the purpose to enhance a pilot’s situational awareness (SA), aeronautical decision-making (ADM), and single-pilot resource management (SRM) capability. Groundbased inspections may include verification that the flight deck reference guide is in the aircraft and assessable, system driven removal of “Xs” over engine indicators, pitot/static and attitude displays, testing of low level alarms, annunciator panels, setting of fuel levels, and verification that the avionics cooling fans, if equipped, are functional. [Figure 2-6] The AFM/POH specifies how these preflight inspections are to take place. Since an advanced avionics aircraft preflight checklist may be extensive, pilots should allow extra time for these aircraft to ensure that all items are properly addressed.